Too bad nobody thought it might be worth fleshing out these characters first. Expectedly, it’s Malkovich and Cumberbatch who get the best lines and ample opportunity to have fun with their (voice) parts. 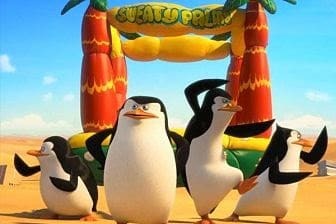 But for the latest installment of a much-loved franchise, The Penguins of Madagascar feels surprisingly underwhelming. I’m going with two out of five. Four penguins break into Fort Knox for what they consider to be worth more than gold – a vending machine of ‘Cheezy Puffs’. Once inside, they are kidnapped by the octopus Dave (Malkovich) who nurses an old grudge against them. They escape but now have to foil Dave’s master plan to disfigure all creatures cute and cuddly. The pace is brisk – frenzied, even – the animation top-notch and the script is full of witticisms, puns (“Drew, Barry – more power!” Or “Nicolas, Cage – the penguins!”) and there are jokes aplenty for the kiddies as well as belly-busters for the grown-ups. And of course, the penguins are simply adorable. Are the Penguins cute? Of course they are! They are adorable. Does this work as a film? Well, not really! What one would want is a simple story for kids but this one has a lot going on! The adventures don’t stop and just complicate the plot. The penguins are cute, animation and 3D is great! And the running time is just 92 minutes but since the film doesn’t touch the right cord it doesn’t seem worth the time.